Tinea versicolor (pityriasis) – white to brown scaly patches on the body. 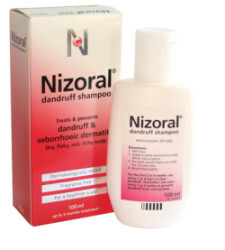 Nizoral shampoo 2% is a hair product that contains the active ingredient Ketoconazole helps relieve the itching and scaling often caused by this fungal infection. Ketoconazole is often used when other medications to treat fungal infections are not sufficient enough. Also contains imidurea 0.2% w/w as a preservative. 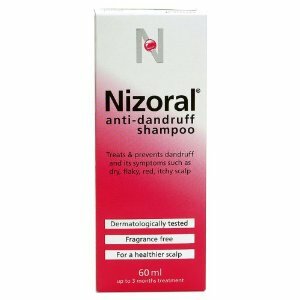 In adults apply a small amount of treatment to wet hair and scalp, work into a lather and leave in contact for 3 – 5 minutes. Rinse thoroughly. Do this twice weekly. Ketoconazole is currently used as an anti-fungal agent in the treatment of fungal infections. Ketoconazole can also be effective in stimulating new hair growth if you suffer from androgenetic alopecia. The pathogenesis of androgenic alopecia is not fully understood. A microbial-driven inflammatory reaction abutting on the hair follicles might participate in the hair status anomaly. The aim of our study was to determine if ketoconazole (KCZ) which is active against the scalp microflora and shows some intrinsic anti-inflammatory activity might improve alopecia. The effect of 2% KCZ shampoo was compared to that of an unmedicated shampoo used in combination with or without 2% minoxidil therapy. Hair density and size and proportion of anagen follicles were improved almost similarly by both KCZ and minoxidil regimens. The sebum casual level appeared to be decreased by KCZ. Comparative data suggest that there may be a significant action of KCZ upon the course of androgenic alopecia and that Malassezia spp. may play a role in the inflammatory reaction. The clinical significance of the results awaits further controlled study in a larger group of subjects. Topical application of ketoconazole stimulates hair growth in C3H/HeN mice. Ketoconazole (KCZ) is an imidazole anti-fungal agent that is also effective in topical applications for treating seborrheic dermatitis and dandruff. Recently, topical use of 2% KCZ shampoo has been reported to have had a clinically therapeutic effect on androgenetic alopecia. The present study was conducted with the purpose of quantitatively examining the stimulatory effect of KCZ on hair growth in a mouse model. Coat hairs on the dorsal skin of seven-week-old male C3H/HeN mice were gently clipped, and either 2% KCZ solution in 95% ethanol or a vehicle solution was topically applied once daily for three weeks. The clipped area was photographed, and the ratio of re-grown coat area was then calculated. The results demonstrated that 2% KCZ had a macroscopically significant stimulatory effect compared with the vehicle group (p<0.01, n=10). Repeated experiments showed similar effects, confirming the efficacy of KCZ as a hair growth stimulant. Although the therapeutic mechanism of topical KCZ for hair growth is unclear, our results suggest that topical applications of the substance are useful for treating seborrheic dermatitis accompanied by hair regression or male pattern hair loss.